September 02, 2018 at 12:31 pm. There was a time when nothing was more precious in college football than a tested, talented, savvy senior quarterback. These days? The kids are more than alright. In Week 1 of the college football season, true freshman quarterbacks wasted no time flinging the football and, in some cases, filling the imaginations of fans with thoughts of big, fat rings and championship parades. 1. 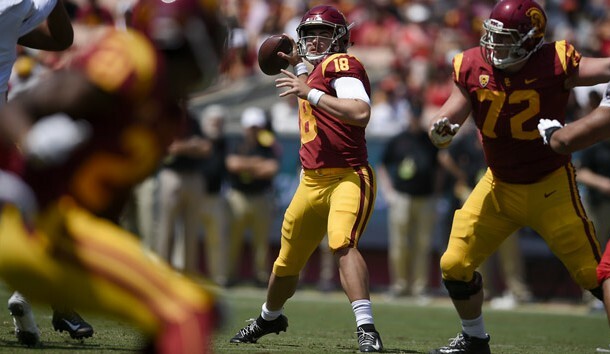 JT Daniels, USC — He worked overtime in the spring to graduate early from Mater Dei High School and reclassify to the 2018 recruiting class, and he then won the job in the camp. “Yeah, it’s goosebumps,” he said of running out onto the field for the first time Saturday. Daniels completed 22 of 35 passes for 282 yards in the 43-21 win over UNLV and had big googly eyes for his former high school teammate, Amon-Ra St. Brown (nine catches, 99 yards). They might rule the Pac-12 for about the next three dozen games. But the learning curve climbs steeply: USC is at Stanford and at Texas in the next two weeks. 2. Trevor Lawrence, Clemson — Rated the No. 1 recruit in the 2018 class in the 247Sports Composite rankings, Lawrence split time with returning starter Kelly Bryant in his debut, going 9 of 15 for 137 yards and three touchdowns against Furman. The competition and the stakes will be much higher this week at Texas A&M, but coach Dabo Swinney indicated the short-term plan is to continue to play both quarterbacks. Our hunch: It won’t be long before a true freshman is leading the No. 2 team in the nation. 3. Justin Fields, Georgia — The No. 2-rated player in the 2018 class is a dual-threat counterpart to Jake Fromm, who merely led the Dawgs to last season’s national title game as a true freshman. Fields was 7 of 8 for 63 yards and a touchdown in his debut against Austin Peay, also running three times for 33 yards. 4. Adrian Martinez, Nebraska — His starting debut against Akron was pushed back to Sunday because of weather problems. The Cornhuskers have to be all in with the dual threat, because Tristan Gebbia, who competed for the job, transferred after not being named the starter for new coach Scott Frost’s up-tempo, spread offense. Martinez should thrive. 5. Dorian Thompson-Robinson, UCLA — New Bruins coach Chip Kelly picked Michigan grad transfer Wilton Speight as his opening-night starter, but the timeline for Thompson-Robinson was moved up when Speight hurt his back in the second quarter. The more-dynamic Thompson-Robinson was going to see some playing time, just not this much — 15 of 25 for 117 yards. He wasn’t intercepted but did fumble, leading to a fourth-quarter safety in a disappointing 26-17 home loss to Cincinnati. The health of Speight’s back notwithstanding, Kelly might eventually decide to force-feed Thompson-Robinson needed experience. 6. Artur Sitkowski, Rutgers — A big spring practice set up Sitkowski to officially win the job in camp. He completed 20 of 29 passes for 205 yards and a TD in a 35-7 win over Texas State, although he was picked off three times. 7. Zack Annexstad, Minnesota — The walk-on, who last season eventually beat out Sitkowski for the starting job at powerful IMG Academy in Florida, eschewed other Power 5 scholarship offers to join his home-state team. Annexstad was 16 of 33 for 220 yards, with two touchdowns and no interceptions, in a 48-10 home victory over New Mexico State on Thursday night. 8. Sam Hartman, Wake Forest — With starter Kendall Hinton suspended for the first three games, Hartman beat out Jamie Newman in camp and then threw for 378 yards as the Demon Deacons survived Tulane, 23-17 in overtime. 9. Alan Bowman, Texas Tech — He came in for injured McLane Carter on Saturday, completing 29 of 49 passes for 273 yards and a touchdown in a 47-27 loss to Ole Miss. 10. Emory Jones, Florida — New Gators coach Dan Mullen is, understandably, going with Feleipe Franks as his starter, with Kyle Trask in reserve. Jones struggled in fourth-quarter mop-up action in the opening rout of Charleston Southern, but maybe his dual-threat skills will come in handy somehow, someway … sometime.